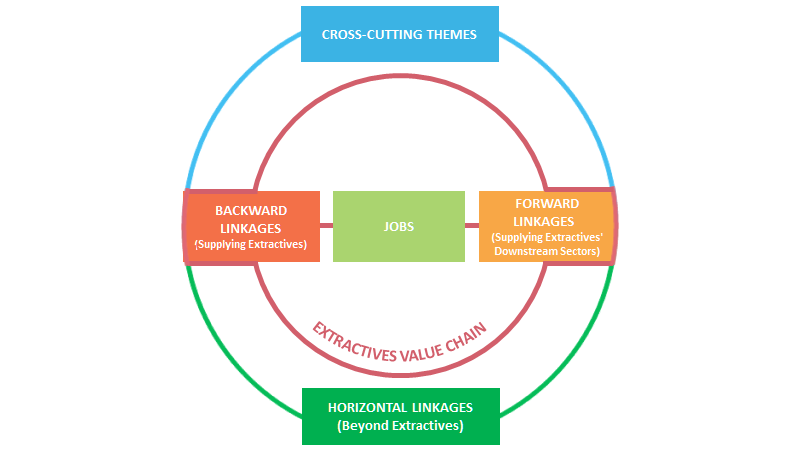 The ELLED Framework is an online resource that contains guidance and supporting material for the design and implementation of Extractives-led Local Economic Diversification (ELLED) policies and programs. Aimed primarily at policy makers in resource-rich countries, the ELLED Framework provides structured and intuitive access to the large and diversified body of knowledge, methodologies, and tools with focus on productive linkages. As such, fiscal and consumption linkages are outside its scope. The Framework was designed to facilitate self-monitoring to allow users to track their learning progress. The Framework’s logical structure is illustrated by the following diagram. The Framework is complemented by an online community of practice called the ELLED CoP, designed to facilitate access to and interaction among policy makers, industry experts, practitioners, and donors on matters related to local content and local value creation in mineral and petroleum rich countries. Any information or quantitative output derived from information contained in this website is for information purposes and should not be relied upon as financial, legal, business or any other advice or recommendation.